We model constitutions by effectivity functions. We assume that the constitution is common knowledge among the members of the society. However, the preferences of the citizens are private information. 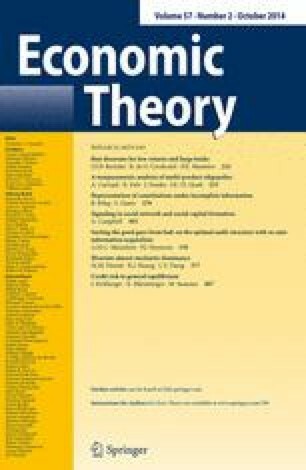 We investigate whether there exist decision schemes (i.e., functions that map profiles of (dichotomous) preferences on the set of outcomes to lotteries on the set of social states), with the following properties: (i) The distribution of power induced by the decision scheme is identical to the effectivity function under consideration; and (ii) the (incomplete information) game associated with the decision scheme has a Bayesian Nash equilibrium in pure strategies. If the effectivity function is monotonic and superadditive, then we find a class of decision schemes with the foregoing properties. We are indebted to three anonymous referees for their helpful comments.